This is our Cowardly Lion Nose. Like most of our pieces, this prosthetic appliance was made to fit most faces. The main picture above is the hot foam latex version applied and painted in yellows and tans. This nose has a droopy look, emulating the Cowardly Lion from the classic film: The Wizard of Oz. It sits low onto the cheeks and has a large rounded nose, it's a must have for any production of The Wizard of Oz. Oddly enough, it could pass as a cartooney bulldog if it were painted differently. It is one piece and comes unpainted by default. Teeth, contact lenses, ears and other prosthetic pieces other than the Cowardly Lion Nose that are shown are not included. 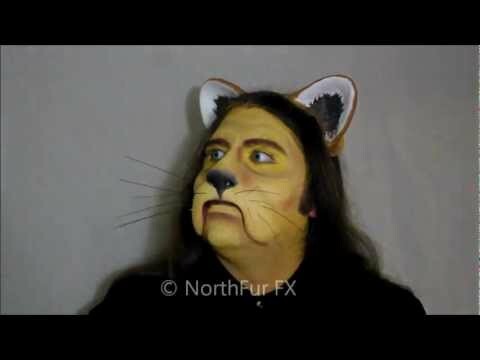 Using these types of costume accessories can help accentuate this prosthetic piece's feline features.